Stacie Smith... Artist. Comedian. Musician. Thespian. Hairsmith. You can see her chalkboard drawings at Art House's 11th annual 5 x 7 fundraiser that starts tonight. Hundreds of artists with Texas ties have created unique 5 x 7 pieces that all sell for $100. All pieces are anonymous until purchased. Stacie has some of her large abstract pieces in her hip South Austin hair studio. While in the chair for a long needed haircut yesterday she described her iconic portraits for the 5 x 7 show.Frontiersmen (pictured left) are chalk on plywood. 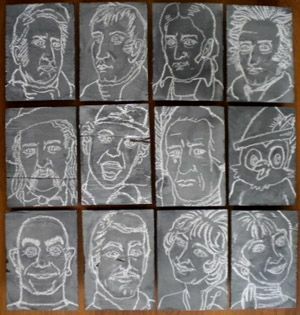 The set features Clark & Lewis, Crockett & Boone (top row); Wild Bill & Doris Day as Calamity Jane in the Musical Calamity Jane, Crying Indian & Woodsy (second row); Mr. Clean & Brawny (70s version), Laverne & Shirley (third row). Hilarious word handler that she is commented on a friend saying "don't you mean Lewis & Clark, not Clark & Lewis". Stacie said "why is it always Lewis & Clark when C comes before L anyway? I bet that really pissed Clark off too!."